New visitors to Keizer Rapids Park might not realize that the sand volleyball courts replaced a smaller court installed by an Eagle Scout as his service project. How and whether to honor that contribution sparked some intense debate among the members of the Keizer Parks Advisory Board Tuesday, Aug. 8. The conversation had its start during public testimony when former city councilor and parks board member Richard Walsh provided an update on the Willamette Water Trail Committee and then switched hats as the father of Michael Walsh, the Eagle Scout who installed the original sand volleyball court. During the meeting, parks board members voted to name the new courts after the Hans and Vicki Schneider family, who donated time, effort and financial support to installing the new courts and are in the process of adding a covered shelter nearby. However, the fate of Michael Walsh’s recognition was left undetermined. Richard Walsh suggested that something in smaller type could be added to the final dedication plaque. Michael Walsh’s original contributions are currently commemorated with a metal sign that hangs on a fence near the courts. Parks Board Member Clint Holland said he spoke to the Schneider family and they preferred that the Walsh dedication remain separate from theirs. “(Hans) said they were fine with leaving the current marker in place,” Holland said. 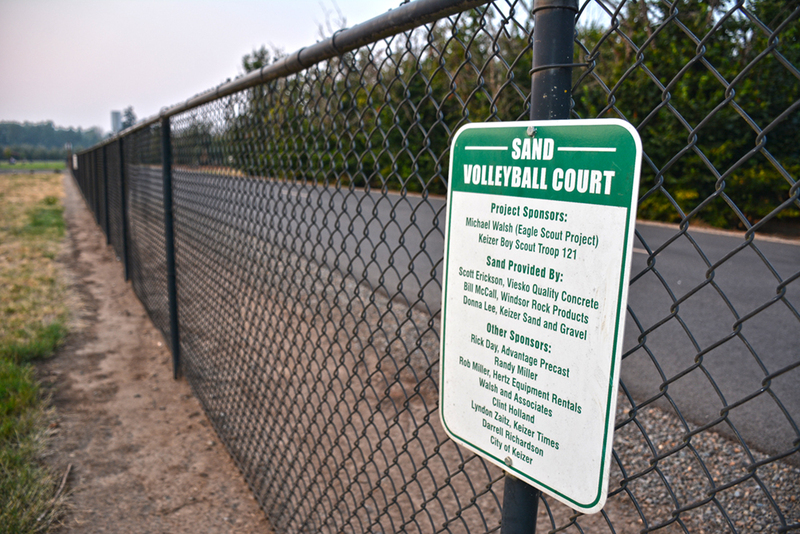 While the parks board has previously-adopted policies regarding dedications, the volleyball court dedications threw a wrench into the works. “We have the parameters, but this is unprecedented because it was something that was replaced,” said Matt Lawyer, a parks board member. Keizer Public Works Director Bill Lawyer saw the dedications as two separate issues: naming the current courts and new shelter, and recognition for projects that have been replaced. Matt Lawyer also saw the issue arising again in the near future, which he said was reason enough to establish new policy. “The skate park is going to be something where we might encounter the same issue. It was great for this area, but the times and needs have changed. Memorialization of prior work is important,” Lawyer said. Carlson Skate Park is in need of substantial repairs for safety reason, which are being prepped, but a larger remodel might be in the works. It’s named after a family that contributed substantially to the $360,000 effort. The city may end up paying for all of the new work with a parks fee, but other donors could arise prompting the need to rethink dedications. A motion to table the discussion until a future meeting failed, and the dedication was approved in it’s place. However, parks board members planned to invite Schneider and Michael Walsh to a future meeting to discuss how the older commemoration could be handled for the volleyball courts.